James Rhodes, a classical pianist, is creating an orchestra for a new Channel 4 documentary to give children across the country the chance to learn to play a musical instrument. He is starting an orchestra at St Teresa’s Catholic Primary School, Basildon. and learing to play recorders, trumpets and violins and other instruments. They are looking for people to donate unused instruments to help as they do not have enough at present. “Music doesn’t really feature in their curriculum at all, so they are starting completely afresh. “Basildon is ground zero for us. I’m hoping the orchestra will be a big hit across the country, and my music revolution will have a huge response nationally. “I want to get us back to how things used to be, when it was normal for children to learn music at school. "Within the space of a generation, music education has been decimated. “We need to put down the games consoles and fast food, and pick up instruments. James has performed at Latitude Festival, Cheltenham Music Festival, the Royal Albert Hall, the Melbourne Festival and other London venues. The programme is will be on Channel 4 in September. 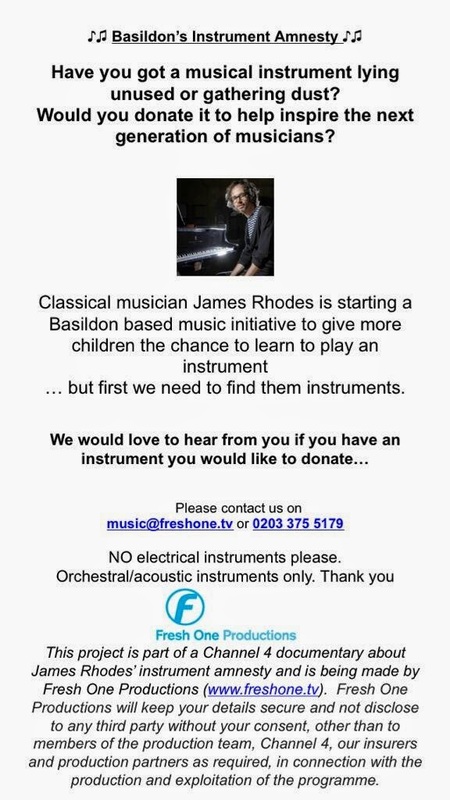 Call 07763 398781 or visit facebook.com/jamesrhodesinstruments if you can help.